Hello everyone! What a difference the sunshine makes! I was beginning to think we wouldn't ever get to spring! We had glorious sunshine yesterday, and hubs was outside giving the lawn its first trim! These were the team swaps I made for our quarterly meeting in April. It was an opportunity to use up some Regal Rose as it is one of the colours which will be discontinued as of 30 May 2013. So if this is one of your favourite colours, email me to place an order while stocks last! I'd resisted getting this stamp set, but at a shoe box swap recently, we did triple stamping using this set and I was hooked! 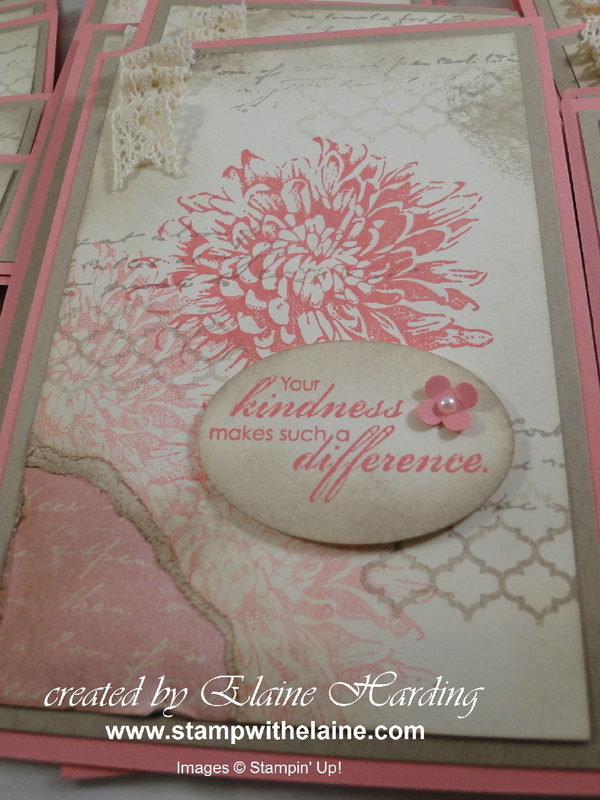 I love the vintage look, so this card was sponged to death with Crumb Cake and I used the Travel Journal builder wheel to create a hint of script randomly, stamped off the Summer Silhouette image before stamping on to the Very Vanilla for my background. 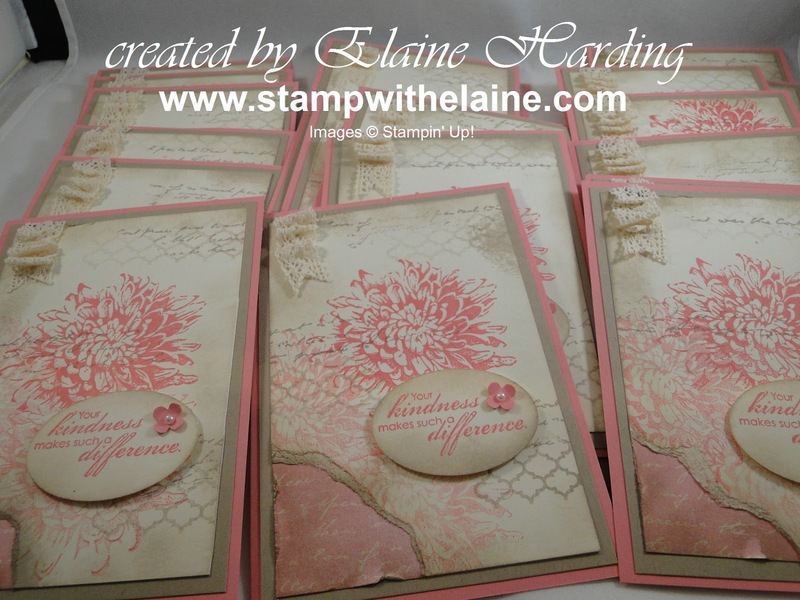 The blossom was then inked in Regal Rose and I stamped three times without re-inking which gives 3 shades of the same colour. The bottom left corner was torn and I attached a piece of Fanfare DSP on the back then mounted it on Crumb Cake and Regal Rose. I stamped the sentiment on some scrap Very Vanilla and punched out with the wide oval punch, sponged the edges and raised it on dimensionals to make it pop. Lastly I punched an itty bitty flower and attached it with a glue dot. I ruched a length of Victoria lace on the top left to finish. 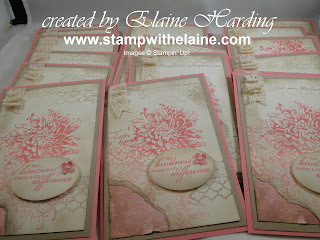 Must dash, today my team of Inkin' Divas are coming for a quarterly meeting so I can impart the words of wisdom my Stampin' Up! Mummy imparted and to share the lovely projects she designed. Thank you Amanda! P.S. It's the London Marathon today, so how many of you are watching? I understand that some will be wearing black arm bands as a mark of respect to the marathon runners in Boston and there will be a minute's silence at the start of the London Marathon. My heart goes out to those families who have had casualties and lost loved ones.